There is a debate about the effectiveness of selling products online for a large retail chain. On one side of this debate is the traditionalist that measure effective retail based on foot traffic through the store. On the other side are the proponents of selling online with consumer facing systems. At the big end of town Australia jumped into eCommerce very early and there were many failures. Why? It was primarily due to the lack of infrastructure available at the time. There was little broadband capability available, most Australian’s had no access to the Internet and those that did used dial-up. This was back in the late 90’s and early 2000’s just around the time of the “dot.com” crash. So there exists in some company’s executive management a view that eCommerce (or selling online) failed in Australia. But also these early projects were too complex and even today we see large enterprises making the same mistake. There are huge investments in the development of eCommerce systems that are wasted. Many never are completed and in fact more than 60% of eCommerce projects fail to materialise or produce a result. This is, in part, due to the complexity of some of those systems and also due to the technology used and the approach taken. By using technology purpose build for ecommerce and rich with features and functions that can be immediately deployed the cost and complexity of projects can be greatly reduced. By using a implementation model with less bespoke development there is a faster "go to market" and a quicker return on investment. As the technology in the Internet world quickens in the pace of change long development cycles are, in themselves, a point of failure. At the enterprise scale there are a number of technologies that are available. Some of these offer a framework, or architecture, within which systems are built and implemented. In general these are high effort and high cost projects where software and infrastructure costs can exceed $1 million dollars easily, where development projects can be estimated in years and 10's of millions of dollars. Although there may be a place for such scale of project we believe that just as much can be accomplished for a fraction of the cost, time and risk. The companies that are the target group in this article will in the most part be retailers or brand management organisations. The retailers will have multiple (maybe hundreds) of outlets. There can be two different market models those that own and run their own outlets (bricks and mortar stores) and the franchise model where there are many stake holders with investments in individual stores. The opportunities vary between these two different models but the core issues are very similar. In the franchise model the online store can be seen as a competitor and the franchiser competing against the franchisee. However if business transacted online can drive new traffic to the franchisee then the issue of competition might go away. The franchisee can also be given the opportunity to sell online and become part of a virtual franchise like it is part of the physical franchise. The franchise model is perfectly aligned as a “community of interest” which could result in a powerful presence. There are very successful retailers in Australia with huge investments in infrastructure who do not sell online. This is not meant as a challenge to them as their model may be currently successful. Looking forward even the traditional retail stalwarts will move to sell online as has happened in other parts of the world. Everyone recognises the need for an online presence but this issue is about selling online. eCommerce or eBusiness for a large corporation is a very broad subject. When we think eCommerce in a small business mostly it is about selling online and B2C. But in a large company there is much more to eCommerce. In today’s business world it has to be a part of the total corporate strategy even if it is a defensive component. Most (if not all) companies in Australia today have encompassed some part of the overall eCommerce picture. It might be ePayments or eProcurement or some form of Business to Business (B2B) capability. What we want to concentrate on here is Business to Consumer (B2C). In a recent article Chris Hitchen, CEO of Getprice.com.au, has said that they have seen a huge increase in traffic to their product comparison portal year over year. This similar message has been delivered by numerous organisations, like PayPal and eWAY, doing business online in Australia. So search online and buy is becoming more the norm as we move forward with consumers becoming used to and feeling safer buying online. The increase in online search and buy has been put down to various reasons; from the current economic conditions and the need to find a bargain; to the changing face of our population and the increasing activities of the Gen-X and Gen-Y demographics. As these generations age and assume more wealth they will increasingly transact online as they have engaged online in other areas from social networks to online games to music and entertainment. Or, maybe there is just not enough free time to enjoy; searching and buying online offers a faster and more time efficient alternative to queuing in traffic, waiting for public transport, fighting for a parking spot or dealing with crowds. And you can do it any time of day and any day of the week. The difference is the cost. It is possible to establish an online store that is fully integrated to existing systems for far less outlay in capital cost than the establishment of a bricks and mortar store. Most modern eCommerce Software has the capability to utilise Web Services and SOAP as a communication protocol to other systems. Some older or legacy applications might not have web services APIs but in that case other file transfer systems and even flat files can be utilised. Orders placed online need to be fulfilled (pick, packed and shipped) as quickly as possible. Part of the integration requirement is to provide an order feed to the ERP solution in use so that new orders can enter the system. This enables effective stock control and management. It might be useful to view these orders as a separate internal account for ease of identification. Online shops may experience a higher level of returns and refunds than a physical store. So the online processes need to be well defined as do the Term & Conditions and the Refund Policy. In the current environment an online shop must be connected to an automated payment system to allow for the handling of credit card information away from the website. There are very specific Payment Card Industry Data Security Standards (PCI DSS) that define the processes around consumer credit card information. There are many compliant payment systems available and there in no excuse for manual processing of credit card data. Payment providers have APIs and documentation that enables the seamless integration with most online shop software. So once the order is completed on the shop and confirmation is sent then the payment has been completed. Credit card data is kept by the payment provider and not on the website. Payment providers have to comply with the PCI DSS and are regularly audited. In addition many have enabled enhanced fraud detection to reduce the potential for fraudulent transactions. Just as you need someone to arrange the physical store you need a person(s) to arrange the virtual shelves (web pages) of the online store. Content like product data, images, special pricing will come from the internal systems integrated to the online store. However you still need some work to arrange the products for best sales presentation. The help desk may need to be organised to handle new requests and over extended hours. Operating costs will vary based on the number of visitors, volume of business, amount of content, levels of integration and technology being used. Visitors and Page Impressions directly translate to bandwidth, utilisation and performance. If the online store is a significant part of the business then the infrastructure needs to be built with that in mind. Generally large eCommerce websites are better hosted in purpose built and accredited data centres. These data centres have redundant and powerful Internet connections, redundant firewalls and switches, redundant power supply and 24 / 7 systems monitoring. Failure of a website or infrastructure, so that it is not available, can destroy many months or even years of business development. It is possible to quickly and efficiently build and deploy an enterprise level online eCommerce shop operating in B2C (or B2B) mode using the latest generation of technologies. These are flexible and can be easily extended. They integrate with other systems and technology using web services. They come with a full set of pre-built features and capabilities. They run with a high level of security and reliability. They support many Web 2.0 capabilities. The estimates in the above table can be used as a guide and can vary with individual situations. 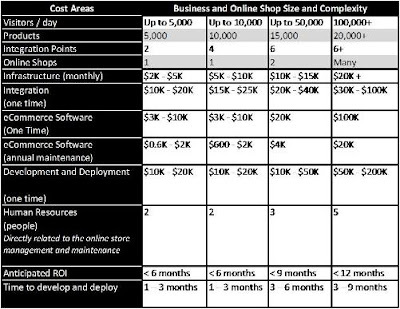 But in general they provide an accurate cost range for the development, deployment and management of an enterprise level online shop. Another option for large enterprises is micro-sites that are targeted at specific products, markets or demographics. These can allow a retailer to test new markets or products quickly and efficiently with a minimal investment of potentially less that $10,000 - $30,000.